(check Jigstones web site), a card mock-up is a good start to check the site on you layout. Cast plenty of blocks ( you can't have too many) . I used ordinary cement and an equal quantity of fine sand to bulk up the mix. Sand sold for a child's sand pit is both fine and clean and preserves detail. Small bags of quick-drying cement are available from places like Wickes and this will speed up setting time and blocks will come out of the mould much quicker. As you can see in the picture, a strong base is essential, and , in this project I have used a heavy plastic. I have seen ceramic floor tiles and plastic cutting boards usually used in the kitchen, used as a base. As to adhesive, I have used `no-nails` and it works for me. Some people use water-proof PVA with equal success. Progress is made, taking into account window and door openings and the holes between blocks filled later with the small `key` pieces. Excess adhesive is best left till dry and cut away with a craft knife. Up to the eaves and the gables are built using the shaped blocks to form the roof. You can see in this picture that the block shapes are still obvious and time now needs to be taken to get rid of as many horizontal and vertical joints. I use a creamy mix of cement with a small amount of PVA to help it to bond and join `slates ` that are next to each other across a gap to form one block that breaks the line. (Compare with photo 5). The tank, window frames and door are made from plastikard mainly `Evergreen`, an American firm that sells packs of strip and sheet in lots of profiles and textures and ` Plastruct` selling angles, girder sections and tube in various sizes. These can be cut with a craft knife or small saw and joined with a solvent such as Plastweld or Mek. The tank panels are reinforced with plastic angle. After trying the tank, I decided that it needed to be higher and I added another layer of blocks to let the spout clear loco height . After getting the tank to a better height, I decided, in a mad moment, to drill the angle at regular intervals and insert a lot of little domestic pins to represent rivets. Not easy to see in the picture. The roof was built up first with a flat sheet of plastic stuck to the Jigstone blocks with `no-nails` and strips of plastic to represent individual slates, staggering the joints on each layer. The slates were `chipped` and textured and glued with Mek, and ridge tiles added. The roof was then painted with acrylic , each slate a slightly different shade of dark grey. 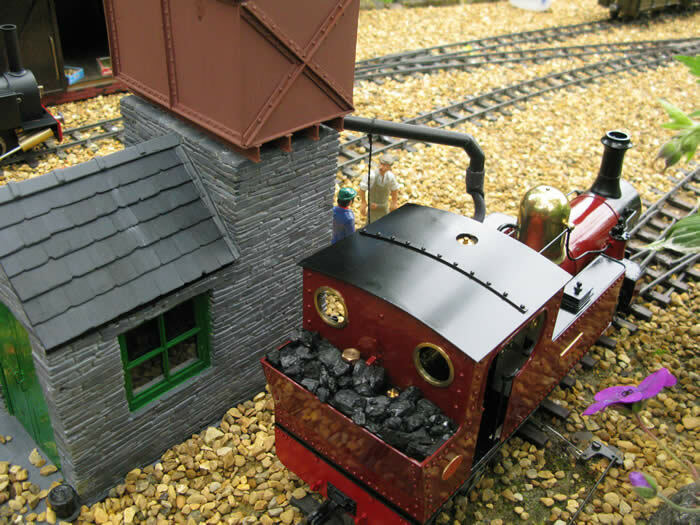 A roof was added to the tank with a trap door, a lever and chain to `pull the plug` and an outlet spout from brass tube, soldered to shape and some plastic detail added. The spout is long enough to reach sidings on both sides. Job done. A bit of history about the wood merchant. The Great x4 Grandfather of the present owner, Timothy Eustace Burr 1831-1907 made his money by manufacturing machinery for the textile industry. He bought his ‘estate’ north of Harrogate and became very interested in trees, having a large area of woodland. He encouraged a lot of wealthy landowners to replace trees that were being cut and to plant species that would be more useful. Many of his ideas were taken on and are still used today by the present Forestry Commission. In his later years, nothing pleased him more than an evening stroll through his favourite woodland path to see trees maturing that he had planted himself. Unfortunately, on one of these evening walks, he was overcome by the severe cold winter conditions and collapsed in the snow and was not found until morning. A sad loss to the country and also the people that he worked closely with. In his memory, whenever a tree is cut down, the forest workers will call out his name, TIM BURR!! !